If you want to enjoy something sweet or if you feel like indulging your taste buds with something yummy and delicious, cake pops are what you should be looking for. Cake pops are one of the popular treats which you can serve in birthday parties or when you want to entertain your guests with a simple dessert. People of all ages simply love to eat cake pops. So, I believe that if you can make it easily whenever you want to in your own kitchen with the best cake pop maker, you will feel great right? Yes! You can translate those cake pop ideas you have into an elegantly designed product. This is why we have taken our time to select the best ten pop makers in the market so that you will not be confused while trying to pick one. Read on and make an informed choice today. 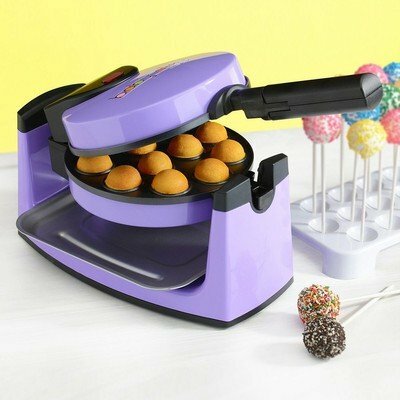 This brand of cake pop maker is versatile and gives you the option to make either cake pops, cupcakes or donut. 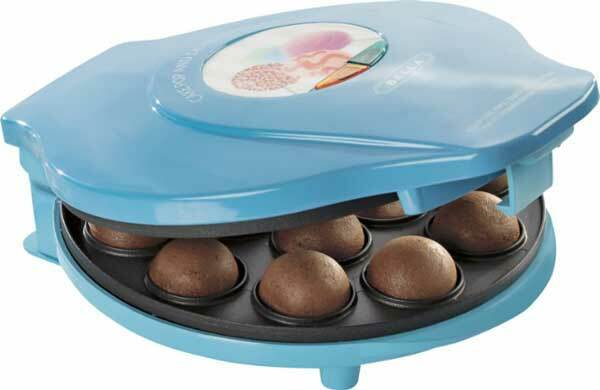 Babycakes multi-treat has three interchangeable plates which you can use for your baking. You can cook varieties of delicious treats for festive occasions or even birthdays. Having this kitchen appliance can expand your menu and keep your guests entertained. 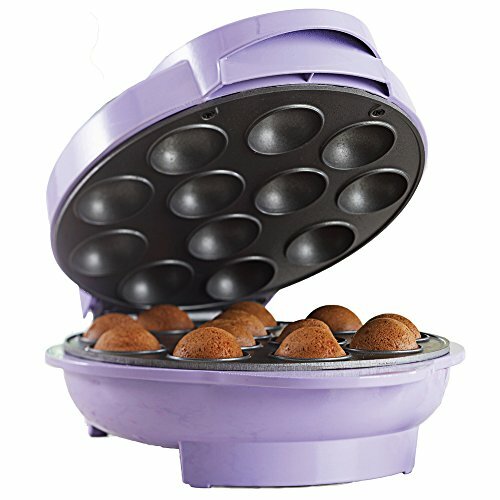 Babycakes Multi-treat Baker gives you the option to make 12 cake pops, 7 cupcakes, and 7 donuts by using the baking plates that come with it. So you don't need to use one plate for three things. Let's say you want to make these three items for your kid's party, all you will do is to mix the batter for each of them and as soon as you finish baking one, you pour the other one and start baking immediately. There is also a latching handle which ensures that the machine is locked very tightly to avoid accidents. This brand also comes with a rubber foot which prevents the device from skidding off the counter. It has a cord wrap which allows users to place it anywhere in their kitchen as they want. Users of Babycakes Multi-treat Baker also have access to varieties of recipes for making many delicious cake pops, donuts or cupcakes. If you are just learning how to make these delicious treats or you want to add more recipes to your menu, you can enjoy the cookbook which is made available to you with your Babycakes Multi-threat Baker. 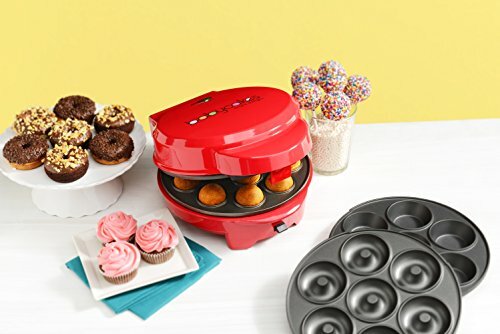 Babycakes Multi-treat Baker has 3 baking plates that can make 12 cake pops, 7 donut, and 7 cupcakes. The power and ready-to-use light tell users when the machine is on and when it has preheated for baking. It has a latching handle locks the device very tight to avoid mishaps while baking. There is a recipe cookbook which present users' with varieties of tips, recipes, and suggestions. If you want to host a party for kids and also desire to feed them with delicious cake pops, Vonshef cake pop maker is just what you need. This brand of pop maker comes with features that making baking and serving cake pops very easy and interesting. This brand of cake pop maker can bake 12 cakes in one batch. It also comes with a stand and this feature alone makes things very easy for you during children parties. Kids can stand around the cake pop maker and pick their delicious treats. Also, if you want to decorate the cake pops, the stand makes the job very easy and simple. There is also 50 cake pop sticks in your VonShef package. These sticks help you to present your delicacies like well-decorated and tasty lollipops. Imagine if everybody including kids and adults can just pick a stick of cake pop and enjoy your food without waiting to be served. This will be very delightful indeed. VonShef cake pop maker has a compact beautiful design which will add beauty to your kitchen décor and also enable you to store easily when there is no space. VonShef enables users to create personalized and delicious cake pops for many people. It can be used to bake 12 cake pops at a time. There are 50 cake pop sticks to enable you to present your treats like well-decorated lollipops. The design is compact and beautiful for décor and easy storage. This brand can be used for any occasion like birthdays, family gathering, children parties, etc. VonShef baking plates have a non-stick coating which prevents stickiness and helps users to wash it easily after baking. This is a cake pop maker which you can applaud for ease of use and storage. Yes! The machine is designed to be simple and yet effective for your home baking when you feel like serving delicious desserts to your family members. It can be fixed and used anywhere in the kitchen and you can also store it in tight spaces. Babycakes mini can be used to bake nine cake pops in one batch. It also has baking plates with non-stick coatings to reduce stickiness when you want to bring out the already baked cakes. After use, you can wash it in few seconds since the mess is minimal after use. When you have filled the holes with batter, the lid covers very tight and the latching handle makes baking very easy. With the four rubber feet, this cake pop maker can sit tight on the kitchen counter without skidding and also prevent the machine from leaving marks on the counter. There is also the power light which shows that the maker is turned on and also help to prevent burns when you are baking. The cord wrap promotes convenience especially when you want to store the appliance after use. It can produce 9 cake pops in one batch. There is a power light which shows when the appliance is on to prevent accidents. Babycakes mini has a latching handle for convenience. The rubber feet prevent the machine from skidding while you bake. The cord wrap makes storage very easy after use. 4. Nordic Ware Cake Pops Baking Pan. This is a brand of cake pop maker that you can use conveniently at home to make those attractive cake pops. The design is beautiful and if you are a lover of Blue, this pan is yours. The Nordic pop maker can contain twelve cake pops at once and although it is not the highest, it will go a long way to reduce your baking time. So if you need to bake cake pops for birthday parties, kids' party and some special occasions, you can use Nordic cake pop maker. Another thing to note is that this specific brand comes with 24 sticks which will help you a lot if you want to feed cake pops to kids. Nordic cake pop maker has a nonstick coating which promotes ease of use and cleaning after use. You can easily remove the cakes after baking without fear of stickiness. When you are done with baking also, you can easily wash it with hands. You don't need to use a cooking spray on the pan to make sure that the cakes don't stick to it. Nordic ware pan is also safe to use in the oven to a heat level of 425 degrees Fahrenheit. The two pans of the cake pop maker are held tightly with tabs which ensures that the cake pops come out round for decoration. This specific brand is one of the best cake pop makers you can find among the products that are made in the United States. It has 24 sticks as part of its accessories. This brand can be washed with hands. Nordic ware cake pop maker is a brand from the United States. Are you aware that some cake pop makers can be used for baking other things apart from cake pops? This brand from Brentwood is one of those versatile cake pop makers which you can use to make delicacies like cake pops, cinnamon buns, donut holes etc. So if you pick this brand, you are getting more than just a cake pop maker. It will enable you to make twelve pieces of different delicacy each time you put it in the oven. This means that in a children party, you can serve different things which you made in lesser time with just one kitchen equipment. While making these assorted foods, the non-stick coating of this specific brand enables you to bring out the baked food easily without experiencing stickiness on the pan. Also, this same feature will enable you to wash the cake pop maker very fast after the whole cooking. Also, this brand comes with an indicator light which shows when it is on and when it has preheated to the level which you want. There is also a long chord for your convenience. 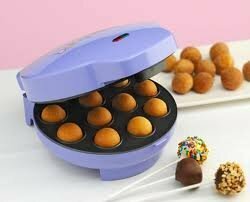 You can place the cake pop maker anywhere in your kitchen and still use it easily without fear of stripping. This cake pop maker is designed in many colors and no matter how you decorate your kitchen, you can find the color that will suit it. This brand of cake pop maker can bake twelve pieces of cake pops in one batch. It can be used to make cake pops, cinnamon buns, and donut holes. Brentwood TS-254 Appliances Cake Pop Maker has a non-stick coating for easy use and washing. There is a power and preheat indicator light. It also has a power chord that promotes convenience for users. Brentwood TS-254 is a product made in the USA. This is one of those brands of cake pop makers that gives the word "complete" a new meaning. Yes! This brand comes with all those fine accessories I was talking about and this cake pop maker is just what you need for serving those hungry kids at your party. 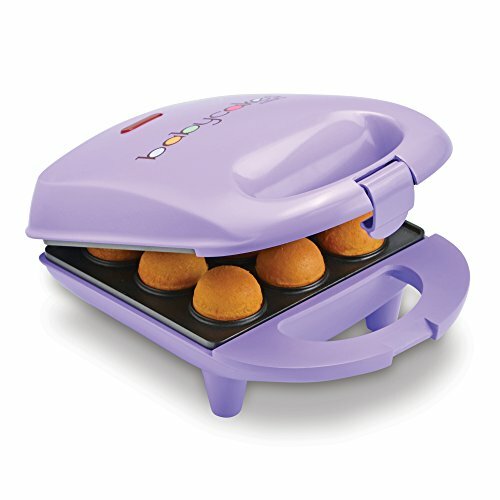 This Babycakes pop maker can bake twelve cake pops or twelve donut holes in one batch. There are seventy-five sticks and a stand in this brand and you will remember that this accessory will help you to serve kids easily in a party. All you will is to ask them to gather around the cake pop maker and pick their food with the sticks. Other accessories like filling injectors and two forks also accompany this brand for your convenience. Babycakes pop maker also has a non-stick surface which helps you to bring out your baked dessert very easily and also wash the cake pop maker after baking. This brand also comes with indicator lights that show when it is powered and when it is ready for use. A latching handle and the cord wrap are also special features that help you to use this cake pop maker with ease. Also, if you are new to making cake pops or you want to widen your skills, this brand offers a recipe book where you can find different types of cake pops to bake. Babycakes pop maker comes with many accessories like two forks, filling injector, stand and sticks. 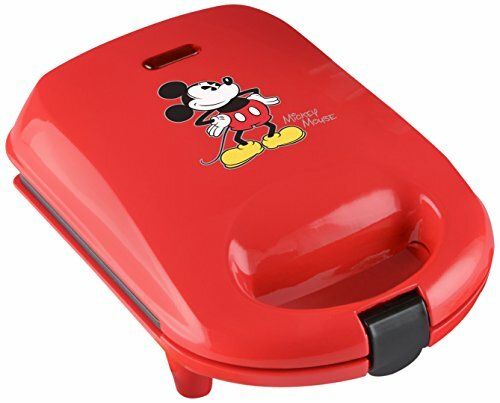 It has a non-stick coating that helps users to bake very fast and also wash easily after use. There is an indicator light, wrapping cord and a latching handle for the user's convenience. The recipe book enables users to experiment with assorted types of cake pops in their kitchen. This is another brand of cake pop makers that will be worth your investments. This brand comes with fine features that will give you a worthwhile baking experience. With Disney cake pop maker, you can bake up to nine cake pops at a time. The design is compact to fit anywhere during storage and the color is bright to illuminate your kitchen. Disney cake pop maker can bake nine cake pops in one batch. The plates are made with non-stick materials which will prevent your cake pops from sticking to the pan when you want to bring them out for decorations. Also, when you want to wash the machine, you will find it very easy because the non-stick surface leaves no mess while baking. Another important thing is that this cake pop maker has non-skid feet made with rubber. This feature enables your cake pop maker to stand very firmly on the counter without shifting when in use. There is a cord wrap which enables users to place the cake pop maker anywhere and still use it conveniently well in the kitchen without fear of mishaps. The power lights will help you to know when the machine is on. This specific brand can bake 9 cake pops at the same time. There is also a power light which shows users that the machine is ready for use. Disney cake pop maker has a non-skid foot that keeps it firmly on the counter. The baking plates are made with non-stick materials that promote easy use and washing. This product is your best choice when it comes to baking cupcakes. If you want to serve those finely decorated and sweet cupcakes to your family or guests, Babycakes cupcake maker will do the work for you in few minutes' tops. This cake maker can bake twelve cupcakes at a time. No matter the number of people you want to serve, this machine will help you to prepare a nice treat for them. Babycakes cupcake maker has non-stick plates that make baking very easy. When your cupcakes are ready, you can easily lift them up without leaving any mess on the baking plates. Also, when you have finished your cooking and want to wash the plates, you will not have much to do because the non-stick plates will be neat. This brand of cupcake maker also comes with a latching lid to ensure that there is no mishap when you are baking. It covers the machine very well to ensure that the cupcakes are nicely baked. Also, Babycakes cupcake maker has indicator lights to show when the machine is powered and when it is ready to use especially when you preheat before baking. Babycakes maker can bake 12 cupcakes in one batch. There are indicator lights showing when the appliance is powered and when it is ready for use. Babycakes works well with a voltage of 1200 watts. If you want to create those delicious treats for birthdays, children party, and family get together, you have the best kitchen help in the flip-over maker. With this Cake Pop Maker, you can twelve delicious cake pops in one batch. No matter the number of people you want to feed, you can prepare the treats in few minutes without feeling as if you did anything. This specific brand of cake pop maker has some great accessories that will make your preparations very easy and complete. It comes with a battered bottle which you can use to fill the cake holes without a mess. There is also a cooling rack where you can arrange your baked cake pops to be aired before decorating. Also, this brand of cake pop maker comes with fifty stick which will add beauty to your creation and help you to serve your guest easier and faster. The power light indicates when the machine is on and the ready lights show you when to start using the pop maker. There are some rubber feet on this maker to prevent it from skidding off the counter or anywhere you place it. This brand is the favorite of many kids and adults because they can create fun treats whenever they want it. Non-skid feet keep the cake pop maker fixed on the counter. This is just the best cake pop maker that will save you a lot of baking time. Imagine that you can bake thirty-five (35) well-rounded brown cake pops in ten minutes. I mean, if you are organizing a kid's party, birthday and any other occasion, this cake pop maker will save you the time and energy which you would have used to bake few cakes at a time. Also, if you want to bring your talent to the market, this machine will help you bake one hundred and five delicious cake pops in three batches. While baking, the non-stick plates fasten things up for you also. You can easily bring out the baked cakes without stickiness and also wash the appliance easily after use. There is also an indicator light to show you that the machine is ready to be used and a safety lock keeps the machine tightly closed when you are baking. 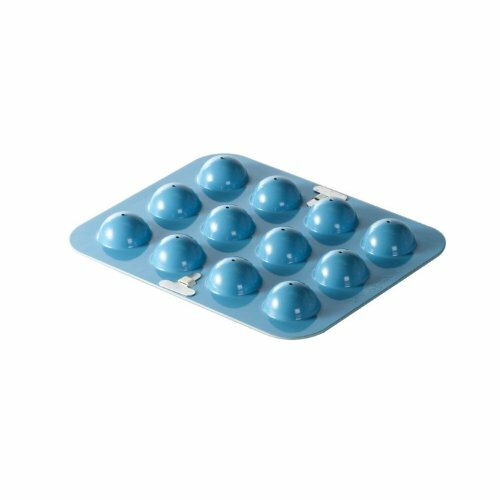 This brand has non-slip feet that keep it firmly on the kitchen counter and the design of the cake pop maker makes storage an easy task. Also, when you buy this cake pop maker, you find a well-detailed recipe book to give you inspiration and widen your baking skills. There is an indicator light to show when the machine is on and ready. The baking plates have a non-stick coating for easy baking and washing. When you are baking, the safety lock keeps the machine firmly shut. In order to guide your choice further, there are certain things which we must point out to you before you make a choice. Don't just pick any cake pop maker, consider these factors first and you will make the right choice. ​ Yes! Cake pop makers come in different capacities. Some can make few cakes at the same time while other brands can cook up to 12 pops at a time. So, if you want to feed a party of kids, you should get a larger maker so that you can satisfy their hunger easily. Also, you can pick a brand that can cook few cake pops if you are only serving yourself or few persons. So in order to make the right choice, decide on the capacity that will meet your needs. If it is for many people, go for a larger model but if it is for few people, pick a smaller model. Don't waste your money on something that will not be suitable for you. this is another factor you need to consider before deciding on the brand to go for. There are cheap cake pop makers while there are some expensive ones. If you are on a low budget, you will find a pop maker that will still serve your needs. However, these low-cost cake makers can only provide baseline functionalities like shorter bake period, 9 cakes per batch and bamboo sticks sets. The medium cost makers, on the other hand, comes with added features like non-stick surfaces, 12 cakes per batch, and some cartoon characters for designs. Some of the high-cost pop makers come with different tools that will allow you to decorate your cakes, they can produce up to 35 cakes at a time and also come with slip-resistant bases. so many brands include fine and handy accessories in their cake pop maker package including sticks, fondue pot for melting, cake stand, cups or cake turntable etc, while some don't. Some of these accessories can help you to decorate the cakes or insert fillings into the cake. Other important accessories like a fork, a pop stand etc will help you when you are organizing kids' party. Also, some brands come with sticks which enable kids to just grab the cakes and enjoy themselves. So, if you want to use your cake pop maker to produce cakes for kids, you need to bet a brand that has complete accessories to help your effort. this is another important factor you must consider before you pick a cake pop maker. Any brand that has a non-stick coating makes users very happy because it is easier to use and clean the equipment after use. The non-stick surface allows you to remove the cakes after baking without experiencing stickiness. When you are done with your baking, you can easily clean off the pop maker. Some brands that have metal surfaces require that you apply a cooking spray in order to get a non-stick surface. Also consider for buying a range hood to set under cabinet in your kitchen. So if you want to use few minutes to finish everything about making those delicious cake pops, you have to consider picking a brand that comes with a non-stick surface. 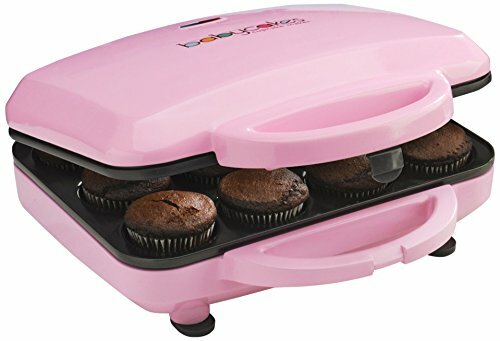 if you are a time user, wouldn't it be perfect if you can get a cake pop maker that will provide you with recipes and tips on making tasty treats? Many brands come with a recipe cookbook and even if you know how to make cake pops, you can widen your skills by learning more recipes from other cooks. Apart from those cake pop recipes, you can also learn other things which you can make with your cake pop maker like, mini brownies, cinnamon rolls, muffins etc. Apart from the five I mentioned above, there are few extra things you should consider before picking any brand. Things like, a long power cord for convenience, a handle that will allow you to hold the maker with ease and indicator lights to indicate that the cake pops are ready. Now that you have seen these factors, check out these ten brands which we carefully picked for your perusal. There are many others in the market but these brands have been selected because they are complete and can give you what you want. Using a cake pop maker may seem very difficult if you are just starting. After picking the best brand out there, you need to know how you can use this kitchen equipment to make delicious and yummy cake pops which your guests will enjoy. This is why we have prepared this guide to show you that the cake pop maker is very simple and straightforward to use. Before we go ahead, I want to point out that the best cake pop maker to use is a brand with a non-stick coating on the baking plates. Remember that you must read the instructions carefully because there are safety precautions which you can find in the manual. Also, don't touch the surface of the plates with your fingers if the machine has been turned on. This is to save your fingers from burns. If you want to bake with the machine, the first thing you need to do is to make your batter depending on what you want. Let's use a simple vanilla cake pop recipe to explain easily. To make this type of cake pops, you need the following ingredients: 1 egg, 2 ounces of butter, 2 ounces of flour, and little milk and vanilla essence. When you have gathered them, mix all together and you have your batter. After making the batter, use a damp material to clean the cake pop maker before you plug it in. Just remember that you must not allow water to touch the cords or immersing the maker into the water. Press the start button and if your machine needs to preheat, close the lid and allow it to heat for few minutes. When the pop maker is ready for use, the indicator light will show you if you bought a brand that has that feature. When the indicator light comes on, use your oven mitt to open the lid of the machine. Then pour the batter into each of the small openings. Avoid overfilling it so that the reservoir can still contain the rising batter. After filling the pops, carefully cover the cake pop maker and bake for some minutes depending on the instructions. When the cake pops are ready, allow to cool and remove them with the fork before decorating them. Cake pops are simply one of the best treats you can offer to your guests anytime. It doesn't matter whether they are adults or kids, everybody loves those delicious cakes. When they are decorated to look attractive and easy to pick, they make the perfect dessert for parties and other occasions. After reading this article, I believe you have understood the need to make an investment in one of the best cake pop makers in the market. Like I said earlier, there are many brands out there but when you consider the factors we listed above, you can make an informed decision. The brands of cake pop makers we selected can bake good numbers of cakes at a time. We have the ones that can produce nine, twelve and even thirty-five in one batch. This means that you can pick for home use, parties and even for commercial purposes. Therefore, if you have decided to include the cake pop maker in your list of kitchen wonders, make a choice from the ten which we have selected. I think any of cake pop makers will worth your investment.